Could Apple really read your iMessages - or hand them to authorities? Research firms QuarksLab claimed on Thursday that Apple can theoretically intercept users' iMessages and read them or hand them over to authorities, but Apple responded that that's simply not true. 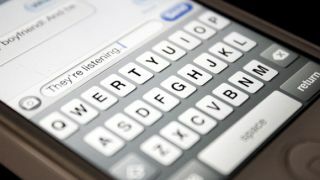 "iMessage is not architected to allow Apple to read messages," an Apple spokesperson told AllThingsD. "The research discussed theoretical vulnerabilities that would require Apple to re-engineer the iMessage system to exploit it, and Apple has no plans or intentions to do so," the spokesperson continued. QuarksLab presented its findings at the Hack in the Box conference that took place this week in Malaysia. The group said that while Apple's end-to-end encryption is secure, Apple "can change a key any time they want, thus read [sic] the content of our iMessages." The security and hacking community so far has reportedly found few faults with QuarksLab's theory, which is apparently quite complex. However, the researchers emphasized that they're not claiming Apple does read your iMessages; only that it can if it chooses to. iMessages are messages sent between iOS devices that Apple has long claimed are more secure than standard SMS messaging. The iMessaging service supposedly even thwarts U.S. law enforcement agencies like the Drug Enforcement Administration. Then again, the service clearly isn't foolproof. Is any data safe? The NSA supposedly collects 250 million email contact lists a year.